Anatomically, thalamus is located above the midbrain and is a large ovoid mass of grey matter, subthalamus is a small amount of nerve tissue from which it’s divided by. There are 2 thalami situated 1 on every side of a slit-like cavity, the 3rd ventricle. Every thalamus is 3.5 cm long and 1.5 cm broad. The long axes of the thalami are running backwards and laterally and are set obliquely. The wider posterior ends are divided from every other by pineal body, superior colliculi and habenular triangles, on the other hand the pointed anterior ends are nearer to the median plane. The thalami are typically connected from the other side of the median plane by a narrow interthalamic connexus of grey matter (also termed interthalamic adhesion). 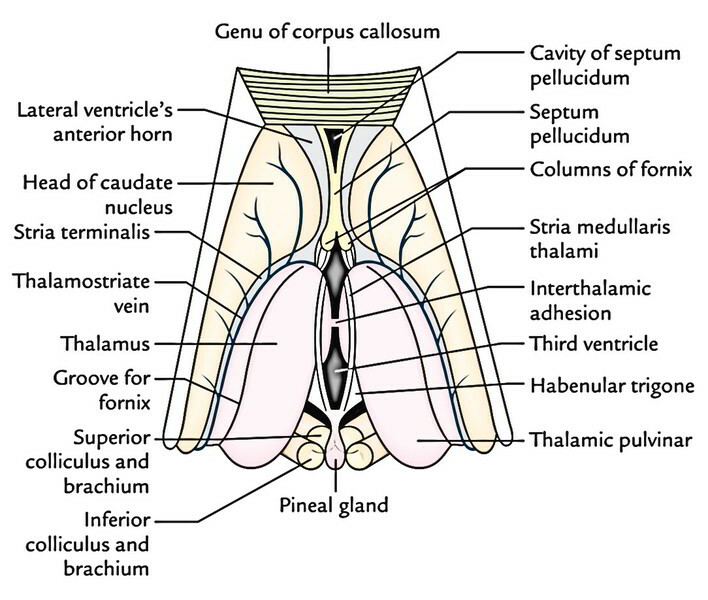 Every thalamus creates majority of the lateral wall of the 3rd ventricle and floor of the central part of the lateral ventricle. Functionally, thalamus is regarded as the excellent sensory gate-manner to the cerebral cortex. It gets nerve impulses from the opposite half of the body and carries majority of them to the sensory area of the cerebral cortex (Brodmann areas 3, 2 and 1). Every thalamus has 2 ends and 4 surfaces. The anterior end is narrow and makes up the tubercle of thalamus. It creates the posterior boundary of the interven-tricular foramen. The posterior end is enlarged and is called pulvinar. It overhangs the medial and lateral geniculate bodies and superior colliculi with their brachia. Its lateral part creates the floor of the central part of the lateral ventricle and its medial part is covered by the tela choroidea of the 3rd ventricle. Its anterior part is fused with the subthalamus while its posterior part is free, creating the inferior aspect of the pulvinar. It creates the greater part of the lateral wall of the 3rd ventricle. It creates the medial boundary of the posterior limb of the internal capsule. The thalamus is traversed anteroposteriorly by a vertical sheet of white fibres, the internal medullary lamina which bifurcates anteriorly to assume a Y-shaped shape. This Y shaped internal medullary lamina breaks up the thalamus into 3 primary parts: anterior, medial and lateral. The anterior part contains the anterior tubercle and is located between the ‘limbs’ of the ‘Y’. The medial and lateral parts are located on each side of the ‘stem’ of the ‘Y’. Every of these parts are composed of a number of nuclei. The nuclei in this part are jointly called anterior nucleus. Nuclei in medial part include a large medial dorsal nucleus and a small medial ventral nucleus. The lateral part is split into dorsal and ventral parts. The dorsal part is subdivided craniocaudally into 3 nuclei: lateral dorsal (LD), lateral posterior (LP) and a large caudal nuclear mass, the pulvinar (P). These nuclei are referred to as dorsal grade of nuclei. The ventral part is also subdivided craniocaudally into 3 nuclei: (a) ventral anterior (VA), (b) ventral lateral (VL) or ventral intermediate (VI) and (c) ventral posterior (VP). These nuclei are named ventral grade of nuclei. 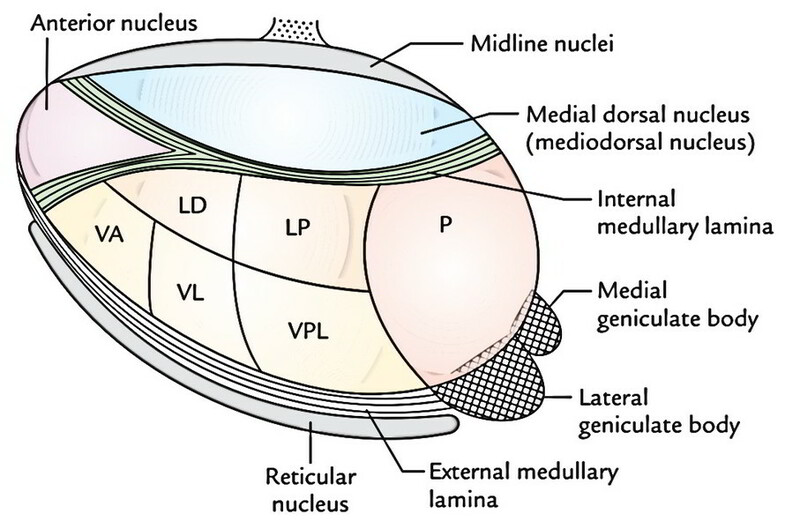 The ventral posterior nucleus (VP) is further subdivided into a lateral part, the ventral posterolateral nucleus (VPL) and a medial part, the ventral posteromedial nucleus (VPM). From a clinical point of view the connections of ventral posterior nucleus are most significant because its smaller medial portion, the ventral posteromedial nucleus (VPM) gets general sensory modalities from the head and face via trigeminal lemniscus and flavors sensations from taste buds via solitariothalamic tract; and its bigger lateral portion, the ventral posterolateral nucleus (VPL) gets exteroceptive sensations (pain, touch, temperature) via spinal lemniscus and proprioceptive sensations (muscle and joint perception, shaking, 2 -point discrimination) via medial lemniscus, from the remaining portion of the body with the exception of face and head. All the sensations reaching the ventral posterior nucleus are carried to the primary sensory area of the cerebral cortex by fibres going through the posterior limb of the internal capsule (superior thalamic radiation). The vascular lesions involve posterior limb of the internal capsule which some-times cause damage of all creates of sensitivity on the other side of the body. The integrity of anterior nucleus and its links is essential for focus and recent memory, consequently, a lesion involving it can result in loss of recent memory. Since the medial dorsal nucleus is related to ‘moods’ and psychological equilibrium, determined by the character of the current sensory stimulation and previous experience, the disposition might be that of well-being or malaise or of euphoria or light depression. It’s a sensory integration and relay station of all the sensory nerve pathways with the exception of the olfactory nerve pathway that is projected directly to the cerebral cortex without being relayed in the thalamus. It’s capable of recognition, though badly, of pain, thermal and some tactile sensations at its own level. It typically takes place subsequent to a vascular lesion of the thalamus, when the patient is recuperating from a thalamic infarct. In thalamic syndrome, the threshold for pain, feel and temperature is fell on the other side of the body (thalamic overreaction), but when the threshold is reached, the sensations are exaggerated, perverted and disagreeable. By way of example, the prick of a pin might be felt as a severe burning sensation and music which is usually gratifying may be disagreeable. Occasionally even light touch may generate excruciating pain, which might become intractable and don’t react to strong analgesics (pain-relieving) drugs. There might be psychological uncertainty with impulsive laughing and weeping.